The soloists of the Luxembourg Sinfonietta performed at the cultural centre Kulturfabrik, Esch-sur-Alzette works by Marco Kraus, José Manuel López López, Giacinto Scelsi, Camille Kerger and Christian Lauba. The ISCM Section of Tatarstan presented in association with the Symphonic Orchestra of Kazan a concert featuring symphonic music from Luxembourg. Tindaro Capuano clarinet, performed at the Soirées Musicales Bissen works by Olivier Messiaen, Valentino Bucchi, Franco Donatoni, Luciano Berio and Karlheinz Stockhausen. The Kapralova String Quartet from the Czech Republic performed works by the women composers Vitezslava Kapralova, Marta Jirackova and Sylvie Bodorova. Participation in the annual Congress of the International Association of Music Information Centres (IAMIC) in Norway. Participation in the General Assembly of the International Society for Contemporary Music (ISCM) and the World Music Days 2001 in Yokohama. Presented in association with "Les Amis du Château de Bourglinster"
In order to further establish Luxembourg as a European centre for musical innovation, the LGNM launched a new project, its first International Composition Prize. For this event, composers from all over the world were invited to compose new works for the ensemble Luxembourg Sinfonietta. A total of 137 candidates from 33 countries participated in the competition. In December the international Jury, consisting of Pierre-Yves Artaud (France), Miroslav Pudlák (Czech Republic), Gerhard Stäbler (Germany), Caroline Wilkins (England) and Marcel Wengler (Luxembourg) had selected the works for the final round and nominated the following finalists: Carsten Hennig (Germany), Thoma Simaku (Albany), Ittetsu Shimizu (Japan), Nicholas Sackman (England), Carlos Satué (Spain) and Stéphane Altier (France). 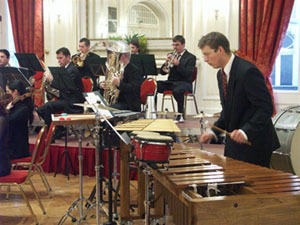 Closing Concert of the first International Composition Prize Luxembourg 2002. The international jury, consisting of Pierre-Yves Artaud (France), Miroslav Pudlak (Czech Republic), Gerhard Stäbler (Germany), Caroline Wilkins (England) and Marcel Wengler (Luxembourg) had selected these works for the final round in January already. A total of 137 candidates from 33 countries participated in the competition. The Japanese composer Ittetsu Shimizu won the first prize in the International Composition Prize  Luxembourg 2002. With his work Suspiria de Profundis, the youngest finalist, 26 years old, won over the international jury in the face of competition from five other candidates.The second prize was awarded to the German composer Carsten Hennig from Dresden and the third prize was for the work Treize Fragments de la Danse by Frenchman Stéphane Altier, who lives in London. The Japanese composer Ittetsu Shimizu won the first prize in the International Composition Prize  Luxembourg 2002. With his work Suspiria de Profundis, the youngest finalist, 26 years old, won over the international jury in the face of competition from five other candidates. The Luxembourg Society for Contemporary Music has invited composers from all over the world to compose new works for its second International Composition Prize. 127 composers applicants from 26 countries participated in the competition, the countries being Australia, Austria, Belgium, Brazil, Canada, China, Denmark, Finland, France, Germany, Great Britain, Greece, Ireland, Israel, Italy, Japan, Korea, Latvia, Lithuania, Mexico, the Netherlands, Philippines, Spain, Sweden, USA, Yugoslavia. The international jury consisting of Theo Brandmüller (Germany), André Laporte (Belgium), Claude Lefebvre (France), Karen Tanaka (Japan) and Marcel Wengler (Luxembourg) has chosen six works to be played in the final concert of the International Composition Prize Luxembourg 2003. 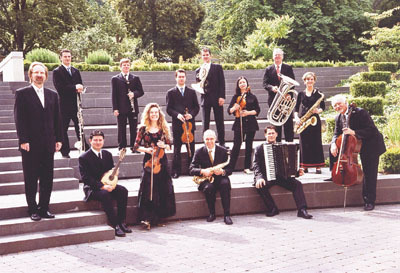 2 violins, viola, violoncello, piano, mandolin, accordion and percussion. The Spanish composer Francisco Lara won the first prize in the International Composition Prize  Luxembourg 2003. With his work Dust Lara won over the international jury in the face of competition from five other candidates. A Special Prize was awarded by the audience to the English composer Paul Robinson for his work entitled Chamber Concerto. The winner, Francisco Lara, was born in Spain in 1968. He started his musical studies in his hometown, Valladolid; in 1987 he began to study in Madrid where he graduated at the "Real Conservatorio Superior de Música" in 1990. In September 1991 he moved to London to study composition and conducting at the Royal College of Music and at King's College where in 1999 he finished a PhD in composition under the supervision of Sir Harrison Birtwistle. 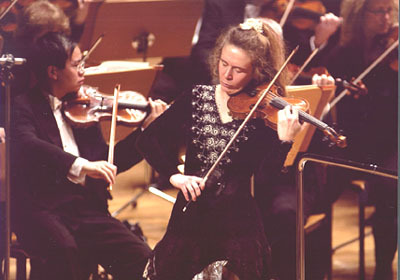 Lara´s music has been widely played both in Spain and Europe. In 2001 his piece Hopscotch was awarded the Spanish Symphony Orchestras Association Composition Prize. 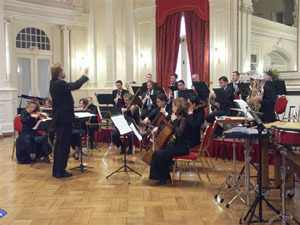 In 1999 Lara created at the University Valladolid a Contemporary Music Festival, which is establishing itself as one of the most prominent in Spain. The second prize was awarded to the British composer Patrick Harrex, who had written a work entitled Hauptweg und Nebenwege for Luxembourg Sinfonietta. Patrick Harrex was born in London in 1946. He studied composition in Paris with Olivier Messiaen and Gilbert Amy and read Music and Education at the University of York. He is currently Chairman of New Music Brighton, an association of composers which promotes regular performances of their music. The third prize was for the work Density  Intensity by the Swedish composer Cristian Marina, who studied composition and electroacoustic music at the conservatories in Stockholm and Gothenburg under among others Magnus Lindberg. His music has been performed at concerts in festivals in most European countries as well as in Japan and Hong Kong. Cristian Marina is a member of the Society of Swedish Composers as well as chairman of the Swedish Section of ISCM. Participation in the annual Congress of the "International Association of Music Information Centres" (IAMIC). 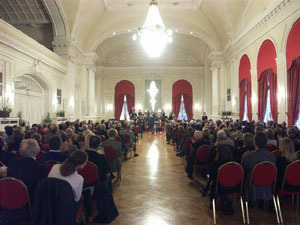 Matinée-concert given by the Luxembourg Sinfonietta with the world première of Plateau written for the Ensemble by Gerhard Stäbler and places  by a departing light by Kunsu Shim. The programme will also include Mahler, Grieg and Brahms and Schubert, arrangements by Marcel Wengler. 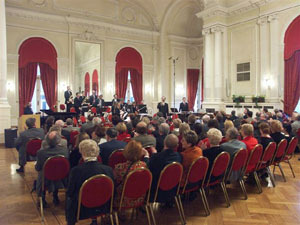 Participation in the General Assembly of the International Society for Contemporary Music (ISCM) and the World Music Days 2003 in Ljubljana. The Luxembourg Society for Contemporary Music announces its 3rd International Composition Prize for the year 2004. Composers from all over the world are invited to present new compositions for the ensemble Luxembourg Sinfonietta. Composers of any age or nationality may submit works for the whole ensemble: clarinet, clarinet bass, alto saxophone, tenor saxophone, barytone saxophone, horn, 2 trumpets, trombone tenor, tuba, 2 violins, viola, cello. The following instruments can be used in addition: piano, mandolin, accordion and percussion. Compositions must have been written especially for the competition; they must not have been performed previously nor awarded a prize. The duration of the work must be stated on the score and be from 10 to 15 minutes. Submissions must be sent by registered mail until 15 January 2004 and they will only be considered if they are anonymous and identified by a code word. The judges will screen the submitted scores and select up to six works to be performed at the Final Concert given by the Luxembourg Sinfonietta on 8 May 2004. The awards will be decided by the judges following the performance. 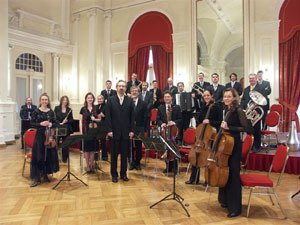 The prize-winning works will be recorded and published on CD. Furthcoming Concerts click Events Calendar ! This site is copyrighted © 1997-2011 by LGNM - Lëtzebuerger Gesellschaft fir Nei Musek a.s.b.l.